Friendship. Arrived Safe and Sound. I love getting surprises in the post. When I signed up for Rarasaur’s Peace Bracelet Giveaway, I knew for sure that I’d forget all about it and then have a nice surprise. Even though Rara told the world when she posted them, I was still surprised when yesterday a little envelope arrived from California. Who do I know in Newport Beach? I asked myself. Nobody I can think of, I replied, ripping the envelope open. Oh wait…. 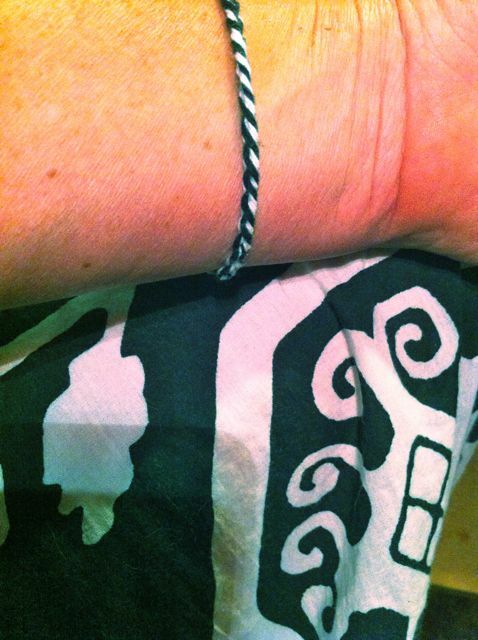 it’s a friendship bracelet… with a peace letter… so it’s a peace bracelet (and an international one at that!). I even made sure I wore a co-ordinating dress (that’s not something I do very often, by the way). Very nice. A dress…what’s that? Dresses are cool things that you were when the weather is very hot. The world NEVER sees my legs between October and May.